One of the most common garage-gym based strength training programs is Mark Rippetoe’s Starting Strength; an easy to follow, incredibly effective, linear training program that focuses solely on compound barbell movements like the squat, bench, and deadlift. Starting Strength (SS) is popular not only because it is super easy to follow and offers near instant strength gains and improvements to body composition, but also because very little is required in the way of gear or equipment. There are only five main lifts to worry about; none of which involve machines, or require dumbbells, kettlebells or other fancy accessories. The lack of special equipment requirements makes SS an especially simple program to follow in minimally-equipped gyms; like your garage gym. The five lifts utilized in Starting Strength include the squat, deadlift, overhead press, bench press, and the power clean. This makes the gear requirements a barbell, some weights, flat bench, and a power rack. 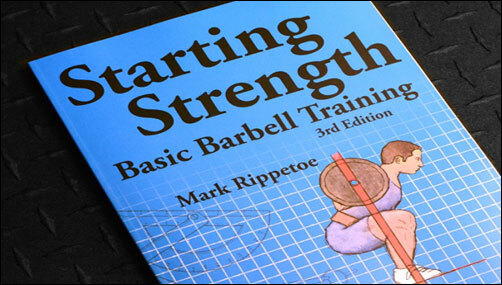 Since the bar is absolutely the most important piece of equipment for any strength training program, and Coach Rippetoe is fairly vague about bar selection in the Starting Strength book, it’s what I’m going to talk about and give some guidance on. Last update: January 2018. Checked for changes in data and pricing. Minor revisions. I’ve said it before and I’ll say it again; when it comes to the equipment in your gym, the bar is not the place to be a cheapskate; it’s just too damn important. If you need to save some cash while building out your garage gym buy used cast iron plates off Craigslist or get your bench off Amazon; do whatever you gotta do to make sure a real bar is in your budget. Now you don’t need to go crazy and spend a grand on a bar, but you can’t spend just $100 either; that kind of money just doesn’t cut it. A bar that sells for anywhere near the hundred dollar mark is garbage, and garbage bars bend easily, lose sleeve rotation, and discard that spray-on chrome finish all over the place. The worse of them are even known to come apart at the sleeve or break entirely. And is if that wasn’t enough, cheap bars are riddled with inaccuracies from shaft and sleeve diameter to bar weight, length, and knurl placement. All sorts of specs are known to be way off with the imported, box-store-style barbells. It’s just a waste and I again recommend you find somewhere else to save money. In order to get a quality barbell that will both perform great and survive years upon years of training, you should expect to pay somewhere in the $250-$325 range; a bit less if you are a woman wanting a 15 kg bar. Sure you can spend more, but you don’t really need to. You definitely want to think twice about spending less than that though. If $250 or more seems like a lot to you, try and remember why you’re even doing this in the first place. It’s really a small price to pay if you’re even remotely serious about your training goals and progress. To help put that into perspective a little bit, $300 is less cash than what your iPhone is worth. You know, that device that even the brokest of people manage to buy every 12-18 months. Priorities! Here is what you should look for in a barbell suitable for the Starting Strength program, or any basic strength training program for that matter. 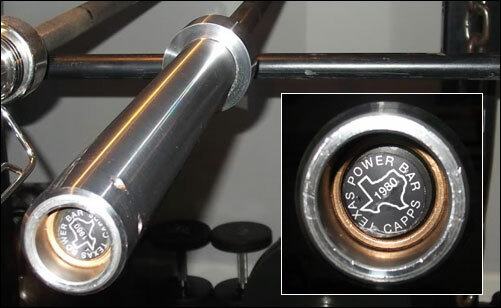 A standard “Olympic” barbell that follows the specification guidelines for either the IPF or IWF. This means a 2200 mm (~7.2 ft) long bar with 50 mm (~2 in) sleeves weighing 20 kg (~44 lb). Some USA power bars like the Texas Power Bar are 45 pounds rather than 20 kilos, and that’s perfectly fine. Shaft diameter should be within the 28 mm – 29 mm range, with 28.5 mm and 29 mm being the most common for power bars. Sleeve assembly should contain bushings, not bearings. The bushings should be either sintered/self-lubricating bronze, or composite. Avoid brass bushings, steel bushings, or any bar that don’t even specify what makes the sleeves spin. Sleeves should be held onto the bar using either an end cap (like seen on the B&R Bar below), or snap rings (like almost all Rogue bars.) If there is a bolt of any kind (usually a hex) sticking out of the end of the bar, you’re looking at the wrong bar. Knurl should be moderate to slightly aggressive. Starting Strength has two heavy pulls (the deadlift and power clean), so you’re going to regret buying anything with a delicate, baby knurl. A center knurl should also be present for back squats. So I’ve eliminated most barbells already by suggesting you not spend anywhere near $100, so the question becomes: what bars can you use? 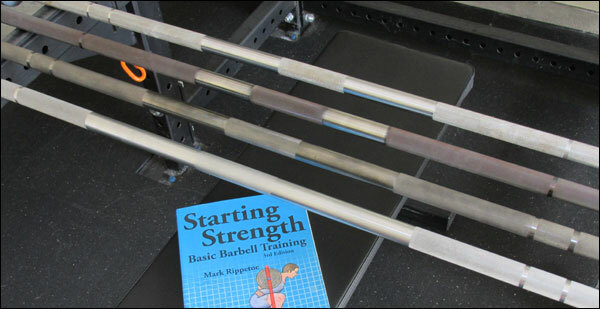 This is the obvious bar choice for many folks following the Starting Strength program being that the Burgener & Rippetoe Bar was co-developed by Mark Rippetoe himself (alongside Coach Mike Bergener.) As you might expect, the B&R Bar meets and exceeds all of the bar requirements of the SS program, and it does so at a very reasonable price. This is the old York B&R, and if you can find a used one in good condition, grab it! The B&R is a raw steel bar, just like in the days of old. 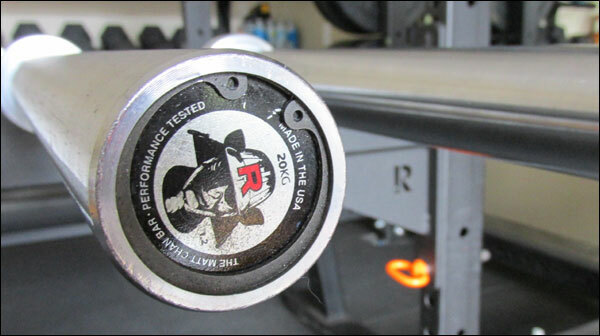 It was manufactured by York Barbell in Canada and sold exclusively at Rogue Fitness for $295, but Rogue took over production a year or two back making it no longer a York Bar – the price is unchanged. The 20 kg B&R has a 29 mm shaft, a pair of bronze bushings in each sleeve, and dual hash marks for both powerlifting and Olympic weightlifting. The knurl is moderate, but secure. The new Rogue Burgener & Rippetoe Bar; still $295. There are a number of reasons why this bar works well for Starting Strength. For starters, it has a bare steel shaft, and bare steel has a very natural and grippy feel to it. Couple that natural, raw feel with the very nicely done knurl and you’ve got a bar that just stays securely in the hands, and does so without sharpness or discomfort. This overall perfect grip is quite important in a program in which 40% of the movements are heavy pulls. Additionally, the B&R has bronze bushings that offer very reliable sleeve rotation for years and years. Even if you lose some of the spin to chalk, dirt, and dust build up, putting a drop of oil in each bushing once or twice a year will completely restore any lost spin. The B&R also has a center knurl for squats; a feature many companies are leaving off their bars. The Rogue B&R is definitely built to mimic the York, but a couple of things did change. First, Rogue increased the tensile strength rating from 190k to 205k; an upgrade that will likely be lost on novices. That upgrade was met with a downgrade – the replacing of York’s sintered bronze bushings with Rogue’s simple cast bronze bushing; a less lubricated and somewhat noisier component. 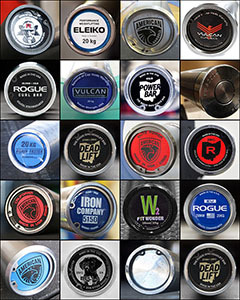 Finally, Rogue replaced the signature York end-caps with their standard snap-ring sleeve assembly. A cosmetic downgrade, but functionally no better or worse. My personal York B&R is about five years old now and it’s not only still straight as an arrow but it spins like new. The raw steel requires some maintenance to keep rust at bay; mostly for the first year or so while the bar develops a patina, but at this point it’s minimal – mostly hands off. I’ll always be a huge fan of the York B&R, but good luck locating one. At the end of the day; be it a Rogue or York; the B&R is one of the best bars for the Starting Strength program, or any similar strength & conditioning program. It’s a modern day classic. The Matt Chan Bar is another great bar for the Starting Strength program. It’s a 190k PSI, multi-purpose (dual-marked) bar with a more aggressive knurl than most multi-purpose bars on the market, and a custom knurl pattern that gives your shins more smooth surface area for pulling deadlifts and power cleans. These knurling features along with the presence of a center knurl and added rigidity of a 28.5 mm shaft (vs 28 mm) makes the Chan feel very at home when doing any of the Starting Strength lifts. Difference in knurl pattern between the Chan (bottom) and a standard power bar. If you’re a scraper, your shins will thank you. As much as I like the York B&R Bar, it’s the Matt Chan Bar that ultimately replaced it. Now I am not necessarily saying that the Chan is superior to the B&R, but I do personally prefer it. I prefer it for a couple reasons, but mostly because I tend to lean toward more aggressively knurled bars; which the Chan is. That may not be for you though. To be fair, part of the Chan appeal for me was the satin chrome finish option; an option that no longer exists, sadly. Better knurl, custom pattern, and a maintenance free finish? What’s not to like? Currently only black zinc is an option for the Chan, and while black zinc isn’t my cup of tea I still think the Chan is an amazingly versatile barbell, and one that has Starting Strength written all over it. Zinc or not, the Chan is still a 10/10 bar for knurl. The Texas Power Bar by Buddy Capps is another good option. Power bars work well for the Starting Strength program since the program is based entirely on powerlifting. The problem that I think most people will have with the TPB is the depth and sharpness of the knurl. This bar will just wreck the hands of most intermediate lifters, and no doubt all novice lifters. The current generation TPB is really designed to be lifted by advanced powerlifters that work in the 1-3 rep range, not in multiple sets of 5’s like in Starting Strength. That said, the older generation Texas Power Bars are not quite the cheese graters that they are now. If you are able to find yourself a used, old school TPB, I think you’d be good to go. The older Texas Power Bars tend to maintain solid sleeve rotation, and they generally stay straight. It’s probably not an easy bar to track down used, but it could be worth looking into. The current generation TPB is a 28.5 mm, 45 pound (as opposed to 20 kg) bar. The deeply knurled shaft is coated in zinc rather than being raw, but the sleeves are still bare steel. The TPB has a 186k tensile strength and is rated for 1500 pounds, which is more than you’ll be lifting. If you buy direct from Buddy on his Amazon listing you’ll pay about $290 shipped. 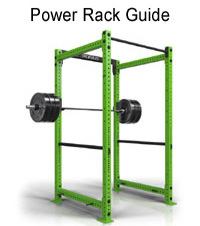 Just about any mid-range or greater powerlifting bar can be used for the Starting Strength program, and there is currently no shortage of reasonably priced power bars out there. The two best priced [good] power bars around right now are the bare steel Ohio Power Bar, and the chrome finished Grizzly Power Bar. Both of these power bars are $250 before shipping, and the beauty of them is that they are polar opposites – giving you two different affordable bars to choose from on a budget rather than two virtually identical bars. Paying any less than $250 is a serious gamble both in terms of performance value and the potential durability of the bar. If you absolutely must spend less than this, I suggest making the best of the CAP OB-86B. It’s not great, and it is still about $160, but it’ll get you by until your skill level necessitates something better. Below is a little more information about the bars I just mentioned, along with info about their alternative finishes and upgrades. The standard Ohio Power Bar in pounds is a 29 mm bar with a very rigid 205k PSI shaft. It is basically the new Rogue B&R with only IPF markings and a far more aggressive knurling (including the center knurl). The Ohio is available in bare steel for $250, black zinc for $275, and finally with a stainless steel shaft for $395. I recommend the bare steel over zinc, or the stainless steel if you can comfortably afford it. Stainless feels just as good as bare steel, but won’t rust. Definitely an end-game power bar, that stainless OPB. Alternatively, a kilogram version of the Ohio Power Bar is also available. It’s a little fancier in that it has friction welded sleeves and is IPF-certified, but otherwise it’s the same bar and will offer the same experience. A black zinc version is available for $325, and stainless steel is available for $425. I don’t believe that any novices need an IPF-approved bar for Starting Strength, but it is your money and your preference. The American Barbell Grizzly Power Bar is a 190k PSI bar much like the Chan Bar, making is slightly less rigid at heavy weights than the 205k bars. The shaft is 29 mm and finished entirely in chrome, and the Grizzly has composite bushings rather than bronze. Of the bars I’ve talked about the Grizzly has the mildest knurl. It’s adequate but by no means coarse or aggressive. It’s the softer knurl and chrome finish that makes it completely different than the Ohio Power Bar. Same price though at $250. Louie Simmons’ Westside Power Bar 2.0 is more or less the same as the Ohio Power Bar, so it could be picked up as an alternative if you’re a Westside fan; or if you like all black zinc bars for some reason. All of these power bars (save for the CAP) are made in the USA. If you want to see some other power bar options or get more detailed information about the bars I just summarized, check out my comprehensive Power Bar Guide. I hope this has helped you zero in on a bar for the Starting Strength program. If you have any questions or comments, leave them below. If you want to be a swell person, share this article on your social media site of choice. Another great article. I notice you only selected bars with a center knurl. How important do you feel the center knurl is for SS? Would a bar without center knurl inhibit someone doing the program, specifically on squats? I prefer it, and if I remember correctly Coach Rippetoe also strongly suggests it. I wouldn’t not do the program because your bar didn’t have a center knurl, but if I were starting fresh and buying a bar, I’d get something with the center. They’re all pretty much passive knurls in the center now anyway. Not everyone even has that problem with the bar sliding down the back anyway. Good form in the low back squat pretty much prevents it. I have a terrible time keeping the bar on my back for squats if the center knurl isn’t there. The bar just wants to slide down my back. Now full disclosure I do have issues with my right shoulder so maybe if I didn’t have that I wouldn’t notice it as much. Why not include the bare steel Ohio power bar which only sell for $250 with best spec? You know I completely forgot about that version of it. The thing was out of stock for so long that I guess I just put it out of my mind. I’ll add that in here shortly, thank you for reminding me. I have the Super Power Bar actually. It’s pretty damn nice. In the article image, it’s the second from the top. Has a nice dark hue to it from heat treatment, does weird things in low light. Anyway, ya it’s not like the TPB or Ohio at all, but it’s stainless so it has cheated the grip. I’m reviewing it currently; had it about a month now. Not to let the cat out of the bag, but it’s probably going to replace the Chan for my personal non-Olympic bar. I wouldn’t say it’s any easier to hold on to than a sharp bar, but it’s as easy, and far more comfortable. Since the Super feels like the other stainless bars from American Barbell despite the heat treatment that’s exclusive to it, I have no reason to think the Elite wouldn’t also feel the same. Sweet…I was looking at Ironwolfe bars and the Artic looks like it has the same hue from the heat treatment. I guess that I am going to have to save up for the Super. Sold the TPB and the OPB for the Super. I had to buy the AB $230 off is a deal that I couldn’t pass up. You got rid of two bars to upgrade? I didn’t like the harsh knurling. I chopped four fingers off to the middle phalanx and the skin is rather sensitive there and tears easily. I have other bars including the B&R so a stiff 28.5mm with a moderateknurling would get more use and is what I have been looking for. I only used The OPB for squats and the TPB has been collectiting dust. The bar rack is still full. Sounds like a reasonable change then. You’re gonna like the Super. Huge fan of the site, thank you for all of the content! I own both the B&R bar as well as the AB power bar. Both are really great bars, but I seem to get better sleeve rotation out of the B&R bar. It also helps that the B&R bar has a slightly wider smooth area off the center knurl for doing pulls. It definitely doesn’t appear to be as much room as the Chan bar, but it still helps keep my shins less tore up. AB power bar is great for training the competition lifts, but definitely not my everyday go-to like the B&R. 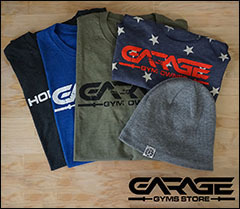 As someone that trains out of my garage I really appreciate all of the insight and reviews that you’ve made available. My budget is not endless, so it’s nice to have an honest and accurate resource other than the useless “This bar is awesome” reviews that seem to flood equipment company websites. Thanks Greg, very kind. Yeah composite bushings don’t spin quite as well as bronze, but they don’t spin poorly enough to be a problem. I think manufacturers know this or they wouldn’t use them at all. The word is that composite bushings are capable of holding onto the lubrication for longer, and in theory they should never deform. Frankly, I have never known of bushings deforming to be a problem anyway, but no doubt composite also saves in production costs. I’m not a huge York fan, but they did pull off the B&R. That thing ages well. Also, some power bars like the AB have actually brought the outer knurl closer to the center, which I don’t understand, but I don’t personally mind either. That kind of thing just makes the Chan more appealing to many though, no doubt. I’m new to the home gym and am all set up now and have a B&R bar. You mention some corrosion possible on the bar. How did you maintain your bar when this came up? Want to be prepared. Oh by the way on a previous post and comment I went ahead and got the Fringesport 45lb bumpers and they look great. Thanks for the advice! Oh yeah you were looking to expand the weight collection. Pretty thin plates right? If you’re willing to oil it once a week with 3-in-1, it will go a long way to keep rust away. Just wipe it down after that days workout. If you do allow it to build up, it can be removed with WD-40 and a steel wire brush. The longer it builds up, the more work it is to take it off. At one point mine was pretty rusty, and it took about an hour with a wire brush attachment for a drill, but it came off. I don’t recommend letting it go to that point obviously. I have to say this though for anyone else reading… don’t use a wire brush on any bar with a finish. This is specific to bare steel bars. Same goes if you’re not going to touch it for a while. Just oil it and it won’t rust. Over time, the bar will develop a patina and it won’t rust as much or as quickly. Excellent review as always. I went to the AB website to check out the newly on sale barbells that you recommended. They are all very nice and very affordable considering the SS quality of the bars. But what stood out to me was the GHD that they are offering on sale at $450. I had pretty much made my mind that my next big purchase would be the Abrams 2.0 from Rogue for roughly $700 before shipping. Now I am obviously having second thoughts. Do you know much about this AB GHD and taking economics into account, should I go with this one instead? Please help me to make an informed decision. Thanks in advance. Rob I’ve never actually seen the AB GHD. Other than the unique sliding mechanism, it does remind me a lot of the original Abrams though. Same basic design, same steel choices, pads, etc. At $450 for an 11-gauge GHD, it’s hard to find a downside. About the only one I can find is that the Abrams has the reinforced plates where the base meets the uprights; which add to stability (though they all shimmy no matter what). I don’t want to straight up say “go for it” when I’ve never seen the thing, but I have no reason to not believe that it’s a great deal. $450 is a better price than many of the econ models out there, as I’m sure you know if you’ve already been shopping around. I’ve used a handful of those econ models and was not overly impressed after owning an Abrams. Again though, price is night and day for econ / Abrams. If I had to buy a GHD tomorrow, it would almost definitely be this one though since it still has band pegs, wheels, and so forth. At full price, I’d still go Abrams just because I am familiar with it and know I like it. I hope this is at least slightly helpful. Thanks again for the speedy response. I am really intrigued by this product. Any GHD units that I have seen in this price range have not been of the utmost quality. As you already stated, I’ve been researching quality GHD’s and besides the Abrams the only other model that I was even considering was the Vulcan for $599 shipped. 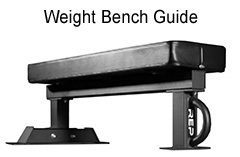 The AB GHD appears to be on par with the quality of the Vulcan but for $150 less. I only wonder now if the shipping cost on the AB would make the savings over the Vulcan a moot point. It appears the sale is going for about another week or so so I still have some time to decide. Again, thanks for your informed opinion. I did a shipping quote on that, and it’s pricey to ship. It says modular design for easy shipping, which basically means it arrives disassembled, so I’m not sure why it needs to go freight. Abrams shipping is a flat $95, and it comes disassembled as well; ground, not freight. To your door the AB is still $150 less which is still good (for the rate it gave me in TX), but not as much as it could be if shipping was handled differently/better. If you’re on the West Coast or anywhere near, you might call AB and ask for a custom quote. Just wanted to follow up with you on the GHD. After much thought and looking for the best value for me, I decided to purchase the Vulcan unit. The AB had no reviews and going in blind on something is just not something that interest me. Also, you mentioned that shipping would be pretty expensive so I went in another direction. My decision came down to the Abrams and the Vulcan. The cost of the products leaned the scales in the direction of the Vulcan. Although I know the Abrams is a great product, at $200 more after shipping I felt that the unit I chose was a much better value. At $599 with shipping included I felt that The Vulcan GHD was a steal. Suffice it to say that I am extremely happy with my purchase. The unit is very durable and at 5’11” and 220lbs I feel very secure while working out on it. The quality is very apparent and I will not hesitate to make another purchase from this retailer in the future. Again thanks so much for your input. I’m looking to upgrade from my cheapy bar. I was more or less set on the Rogue Ohio (45lb) Power Bar. But with the sale going on of the American Barbell Power Bar, should I reconsider? Which would you suggest for someone who does a hybrid of powerlifting and bodybuilding (but no Olympic lifts)? Since no Olympic lifting is involved, you can pretty much go with anything 28.5 / 29 mm. You don’t need a whippy shaft, don’t need bearings. There is nothing wrong with the Ohio Power Bar in this case; nothing at all. However, if you’re willing to pay $325 for the Elite power bar, I cannot begin to tell you how much nicer of a bar that is for the money, even when not on sale. It’s a premium bar, but it’s not unjustified being stainless and all. I’m not sure whether you were looking at the bare steel Ohio or the zinc, but the AB Power Bar (the non-stainless) is still a chrome power bar for $299, which is more than the bare steel, but less than the new friction sleeved zinc Ohio. The normal price of about $350 is about what Rogue would charge for a chrome 28.5 mm bar. $299 isn’t as huge of a sale as the stainless bars, but it’s still a great price. Having said that, the bare steel Ohio is still cheaper than any of the AB power bars, and while different, it’s no less of a bar in terms of what you’ll get out of it in the lifts. The biggest difference you can make is the Elite because you get the superior feel of raw steel but without the any rust, ever, unless you live in the ocean. I was probably leaning towards the OPB in Zinc just for less maintenance. I was trying to keep my cost at or under $300, but you seem to be suggesting that the AB Elite is totally worth it for the extra money. Maybe I’ll have to splurge. Curious why you are proclaiming the Troy TPB to be junk when it’s been said that Buddy Capp makes this for Troy. They are just marketing it under the Troy name is what I was told. Do you have info that states otherwise? There is no way Buddy is making his bar for Troy. It would be the ‘Troy Texas Power Bar’ on all of the sites that are known to sell the real TPB, and there would be no need for Buddy and his dealers to point out how to distinguish the real TPB from the fakes. Also, if you look at Troy’s own website and the product listings for Troy TPBs, there is zero reference to Buddy or it being manufactured in Irving, nor do they ever show the end caps of the Troy bar. It’s a different bar completely. I don’t know the whole story, and I didn’t want to publish this in the article because it’s all hearsay, but the word is that Buddy didn’t patent his bar’s name before it became a popular, well-known product, so it became a free for all with the name. However, he did patent/trademark/whatever his logo later on, which is why they say to look for his logo in the end caps because no one can legally copy that. Very curious situation indeed. A lot of mixed info out there. I’ve seen it posted that Bill Ennis from Weightlifter’s Warehouse admitted that Buddy Capp was making the Texas Power Bars for Troy but could never admit to it due to the legality/contract situation. I emailed and asked and he said he could not say for sure where the Troy versions are made but his company sells them direct from Buddy. The AOB-2000B is the Buddy Capp power bar. AOB-2000B is just our internal code for that item. I have a Troy Texas Power bar. 28.5mm shaft, black oxide finish, just no Texas end cap (there is glue residue as if a cap was there but removed). I can’t say that I have reached anywhere near it’s limits when I’m not quite to 1200 pounds in the 3 lifts but I love it. Great aggressive knurl and nice and stable with the weight I push. If it’s indeed a knockoff then I don’t know if I would say it’s junk. I’d be happy to share any info about it if anyone has a Capp one they would like to compare it with. I’ve read online that the two are completely indistinguishable but I’ve never seen for myself. Might make for an interesting article to rip both apart and examine them. Thanks for the reviews as always, just wanted to comment on that! Yeah I don’t know for sure. Like you said, a lot of mixed information floating around. I saw what was called the Troy TPB at one point and I remember it having a pin sticking out of the end. No end cap at all. It didn’t look like a very nice bar. Couple this with the information from Iron Dawg and TSS, the lack of reference to Capps from Troy, etc etc, it’s easy to see why I err on the side of Troy not at all being associated with Buddy’s TPB. I’ll dig into this some more and see what I can learn from the source. I am not certain that Buddy or anyone at his company will talk to me, but I’ll try. If I get no where, perhaps I’ll look into stripping down both the Troy and the Capps and see if they are the same in any way. Also, Troy has a very few not bad bars in the mix; mostly a couple that tend to be distributed to clubs and school athletic departments via commercial distributors (like Legend, for instance.) The problem is that their retail line of equipment is almost all not so great. Their bumpers are some of the worst in the industry. If you have one of their better bars, that’s awesome. I hope you know I don’t mean any disrespect to Troy owners though, it’s just not something I tend to promote because finding the few gems is more work than it’s worth when you can pick up a Rogue Bar or something and be done with it easy peasy and know you have something that’ll last. No worries. I just thought that was interesting. Before I bought this I did endless research and I had thought the conclusion was they were the same. The ends and pins and everything are the same. Same shaft diameter and finish. I can take some pics if you ever decide to look into it more. if not it’s all good, I’ve been happy with it. What’s interesting to me is that Troy lists on their website that the shaft is 28mm on their TPB. I thought it might be a typo but Buckeye Fitness and other retailers state the same specs. Also, the price of the TPB varies a lot. I bought mine for 299.00 including shipping at Lifestyle Fitness but I have seen them sold for mid 300 not including shipping. The Troy seems Ike on average is sold higher than the Capps. Who knows….Buddy might be doing what other companies do by selling the brand name and the generic and making coin on both ends. Ok so I think I got to the bottom of this. Troy is not licensed to make the official TPB, but Buddy Capps does sell the TPB to Troy for resale. Apparently the problem Capps has with Troy is that Troy commonly sells Troy TPB knockoffs to their customers; both wholesale and retail, because there is much greater margin, and most customers are none the wiser. A genuine TPB regardless of its retail source will still have the Texas / 1980 end cap and Buddy Capps signature on the other side. I’m unclear as to whether that signature is on the actual end cap, or under the end cap though. Still, the Texas end cap should be more than enough to show that its genuine. Also, the reason you see other brand TPBs even beyond Troy is because Buddy did in fact not patent his bar. Only his 1980 Texas logo is his exclusively. So if TPB owners don’t see this exact end cap, you probably have a knockoff. The moral of the story is to buy your TPB from sources that only offer the actual TPB. It doesn’t cost you any more money to buy it from one of these distributors like LB Baker at Iron Dawg, or Texas Strength Systems, but you know you get the real thing instead of a Chinese knockoff meant to look like the TPB. Have you seen the new Troy Power Bar? It is 28mm with dual markings and the sleeves aren’t pinned but have double snap rings. The psi rating is 177,000 and is made in US. Do you think Capps makes this? I’m going to guess no. Buddy would put his name on his bar. Plus I can’t imagine him ever wanting to get in bed with Troy of all companies. Then again, anything is possible. I certainly wouldn’t put my money on it though. It’s not a problem for me, but I’m tall and broad so my natural hand position is wider than that of someone 4-8″ shorter than me. Now, my best friend is 5’4″ and won’t use any other bar despite many other bar options in the gym, so even for ppl who have a finger or two off the knurl, they still like it. Best suggestion I can make is to mark on your bar where that knurl starts and stops with the Chan and do some lifts to see if you think it will bother you. That CAP has fairly rough knurl doesn’t it? I don’t think the Cap OB86b knurl img is very aggressive. I put my hands on an Ohio Power bar at a power lifting gym near me but was not really paying attention to the bars detail, was more focused on their rogue racks. However, I do recall the aggressive knurl, not cheese grater level, but more aggressive than the Cap. I have an Ohio Power here. It’s definitely aggressive. I don’t deal with CAP stuff for reviews and such because frankly that bar you have is their only half decent barbell, but I had heard that it had fairly aggressive knurl. If it doesn’t feel at all like the Ohio Power, then I heard wrong I suppose. I was just curious. Also that video… not to take credit haha, but that video was made about a month after I published an entire guide explaining the difference between all the Rogue bars. It used to be pretty damn confusing on the surface, but very simple once you knew which bars were the same. Someone had to do it. I’d be interested to hear how the CAP bar fairs in your hands for a review. Might be a good reference point for people wondering what is so much better about bars in the $300 range vs. the $150 they’d be paying for the CAP. I definitely took a long hard look at the CAP bar myself but didn’t really have a way to measure it against your other recommendations. Same with the Rogue Beater. I’ve considered picking up the CAP just for that purpose, and I may still. I wouldn’t pay for a Beater though as I think that bar is only a temporary solution. That is, for someone serious about training. The Beater is too close to $200 after shipping, and for a super thick, pinned bar. May as well add $50 or so and get a real bar. The only benefit of the CAP is that it’s a lot closer to $100 than $200, and that’s the only reason I’ve even considered grabbing one. I’ve heard decent things about your CAP. The quality of the steel used is obviously inferior to a more expensive bar; especially something made stateside, but a novice who can’t put enough weight on the bar to bring out that inferiority (in the form of a permanent bend) should be able to get some use out of it. At the end of the day if it opens up the world of training to someone, then I’m all for it. I guess Rogue kicked York to the curb with the B&R 2.0. The in-house bar has the 205,000 PSI. I like my old one, the description of the 2.0 says it has no whip and the York seems to have a little give to it. Looks like they are going to sell for 250 on turkey day. Yeah we’ll see if the new one is better or worse soon enough. I like York’s bushings. They marked the remaining B&R bars down to $225. Would be a nice bar at tbat price for sure. Hi – First, Thank you for all the research you’ve done and posted. 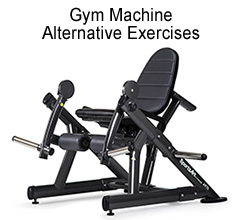 I am new to weight training and in the process of creating my own home gym, so you information is invaluable! I actually was one about to become one of those guys that cheaped out on the barbell, then stumbled upon your web page when I started to look into barbells and wow…you completely changed my outlook on barbells. Anyways, straight to the point. I am trying to decided between two Barbells. 1) The Rogue Bare steel Ohio Power Bar or 2) The AB Power Bar chrome. I am 5’4 with medium size hands. My intended use are the 3 big lifts. My gym will be in a finished basement. I take care of all my toys, so maintenance will not be an issue. My first inclination is to get the OPH bare steel bar due your very detailed review and also because it just looks damn cool and I like the idea of maintaining a bar that ages well as you care for it. But then the AB power bar has the chrome finish, which I believe you stated is a superior finish to everything else (besides Stainless Steel)..So what do you recommend? Thanks! Van. The biggest obvious difference between the two is the aggressiveness of the knurl. The Ohio Power Bar has an aggressive knurl while all American Barbell bars are pretty mild. 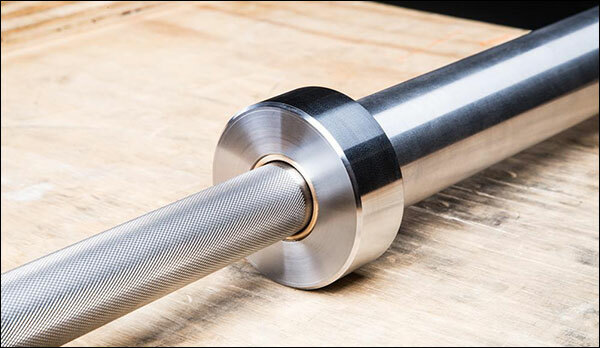 The mildness is acceptable on American Barbell’s stainless steel and newer Cerakote bars where the finish greatly improves grip security, but with chrome and zinc it feels pretty insubstantial. As a newer lifter the mildness of the AB may actually feel better at first, but over time I think you’ll wish you had the OPB. Don’t get me wrong, the chrome power bar and all American Barbell bars are very refined, legit bars, but in this case I think the OPB is just a better bar – and also less costly which works out pretty well too. Truth be told, if ever a person is okay with bare steel maintenance, then that’s all you need to know. Bare steel is just fantastic to lift with. Thank you this is an amazing website! Would you recommend the stainless steel Ohio Bar for starting strength training? Also I don’t plan to do the power cleans, just the other four lifts and presses (squats, press, bench press, and deadlift). If that’s the case, what would be your recommendation? Thank you very much Jon. Yes absolutely – whether you power clean or not. The SS Ohio wasn’t around when I wrote this one, but it would have made the list if it had been. Such an all-around great bar. Ok that’s great to hear. I asked because the SS Ohio does not have the center knurling. I myself have never had a problem with the bar slipping down my back. I’m actually more concerned with scraping my knees on the deadlift in which case the SS Ohio is great for that. So where would you rank the SS Ohio if it was included in this list above? Also thanks for your recommendation regarding the Rogue HR-2 rack. I like to wait until Black Friday to get all my stuffs but I’m not sure if I have the discipline haha. End of the day, the SS Ohio is a great bar, but it doesn’t mean the OPB or B&R are no longer good – it’s just another valid option. Stainless is amazing, and the knurl on that particular bar is better than average – even for Rogue. I don’t think you’d want a true power bar though if you do scrape cause the knurl is everywhere, and it’s sharp. You’ll be buying a lot of those long WOD socks haha. Bleh that’s a long time away. All you save is shipping. Don’t miss months of great workouts for shipping charges! I’m 5’9″ and while I deadlift pretty close to the legs I actually haven’t scraped them yet. I occasionally get bruises from the bar hitting my shins which is totally independent of the knurls. I’ve been using various olympic and power bars (with and without center knurls) from my local gym over the past 9 months without problems. Between keeping the lawn green and the jacuzzi water clear, I’m looking for something with less maintenance. So I think I will get the SS Ohio. I love your comment regarding not waiting for BF to get my gym started. My local gym is so busy it’s pretty much useless after 330pm. 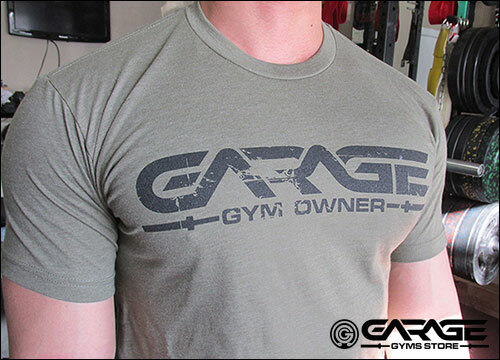 That’s why I started researching garage gyms. I’m going to clean my garage ASAP and get this project going! Thanks again for sharing your knowledge and giving up your time. You’re so knowledgeable about this subject you might consider a youtube channel. With the rising popularity of Starting Strength and CrossFit, you’ll have thousands of followers in no time! I found a chan bar for 240 is it worth it? or save for a new one? Black zinc Chan for $240? Versus $300 + shipping new? If it’s in good shape, yeah I don’t see why not. You’re not going to find much more than 20-25% off the cost of new for a bar that’s still straight, still spins, and still has its finish. If you were to find one for under $200 I’d wonder what the hell was wrong with it. Oh but you should still check the sleeves when you look at it, and roll it around on the floor a little to check for any bending. I mean there are a-holes out there, sadly. I ended up saving for the Bnr 2.0 and got it today!!! I’m excited to have a real barbell lol, so I was wondering how did you maintain yours the first year to develop that patina? I just oiled it about once a month.. more often if the weather was particularly bad (wet). It just happens. I’m 35 years old and decided to begin SS program after years of intermittent “Bro” lifting. I consider myself weak for my age and size and am looking forward to a more goal oriented approach to lifting. Workouts will be done in my garage gym in Louisiana (1000% humidity most of the year). 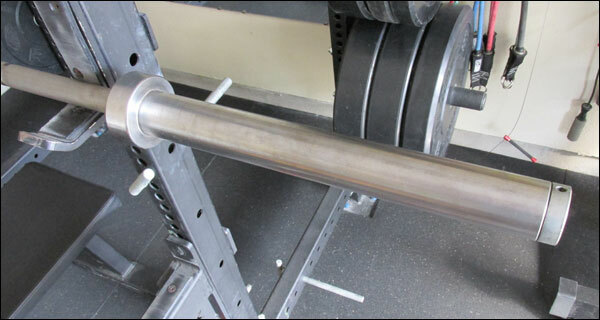 I have decided on a bar with center knurling based on previous experience using an ABB precision training bar for squats. I can’t decide between ABB Elite PB ($450), Rogue OPB stainless ($395) and Rogue B & R 2.0 ($295). B & R bar would be most badass IMO since bare steel and designed by author of SS but I’m worried about weather / corrosion. My old ABB had spots of corrosion and it was stainless. Dumbbells with chrome handles get spots of corrosion as well. Is it possible to maintain a bare steel bar in a place where humidity is often > 80%? I also like the idea of having a bare steel bar and not worrying about it as much… I re-watched “Pumping Iron” a few weeks ago and was thinking if that kind of equipment was ok for Arnold and Lou It should be fine for me. Last question… deciding on plates also. 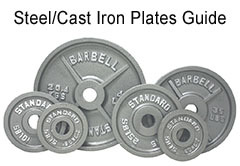 It is between standard cast iron plates from “Rogue” vs there cast iron plates… any thoughts. Price difference doesn’t seen like too much. Thanks for any input. Great article as usual. Personally I’d favor the Elite in your situation. Bare steel can be maintained but it’s going to require frequent attention whereas stainless offers the perks of stainless with far, far less chance of oxidation. Additionally, if by chance you get oxidation on stainless it’s easier to restore because it won’t overwhelm the bar, and it will remain rust-free for much longer once cleaned. Actually the conditions that cause stainless to rust are pretty extreme, and the most common in a garage gym is simply getting other non-stainless metal particles attached to the stainless steel (fragments from metal plates, metal-on-metal contact between the bar and rack/cups/safeties, etc). It’s just much easier to deal with stainless and you get the same feel. I don’t like the SS OPB as much as the Elite because the center knurl of the OPB is intense. Also the Elite is just a quieter, smoother bar. It’s more expensive, but by so little that I think it’s an easy choice. Now going $450 over $295 is more of a budget issue. If you can afford to do it comfortably that is my suggestion. If that extra $155 hurts then I suppose you deal with the B&R maintenance. I used to maintain a couple bare bars and I quickly tired of it and I’m only in Central Texas. Humid, yes. LA humid? No way. If you mean the Rogue Olympic Plates with the “Standard” branding versus the hammertone Machined Olympic Plates I’d lean towards the machined. Accuracy levels are higher; generally better than the 2% promised. But I’m thinking you’re not because prices are not that similar. Can you clarify which two you are referring to? This website is just gold. I go from one article to another, reading in my down-time for my own enjoyment (& to gain new understanding, obviously). Keep up the great work JB. I’m glad. Thank you very much!